Sole Full of Rhythm, Inc. was established in 1996 for the purpose of promoting the American Art form of Tap Dance. Sole Full of Rhythm is a 501c(3) corporation providing opportunities for professional dancers and students to present tap and jazz dance as a unique, indigenous American art form. Under the direction of Sara Randazzo this touring company gives lecture-demonstrations, conducts workshops, and performs at festivals, corporate events and at an annual public concert. Sole Full of Rhythm’s mission includes educating students, creating new choreography for the concert stage, preserving traditional material passed on by past tap masters, and incorporating improvisation and live music into performance as in the jazz tradition. The company’s three divisions – Professional, Student and Apprentice – gives an opportunity to study and perform to all who have a passion for tap. Sara and Joseph and Griffin all tap their way into your hearts from this live show at the Riverside Centre for the Arts. 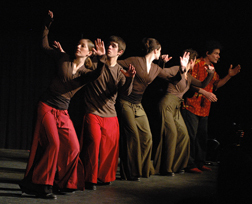 Sole Full of Rhythm is available for lecture demonstrations, workshops, performances, festivals and corporate events. For more information, please send us an email using the "Contact Us" form at the bottom of the page. If you would like to receive news and updates from Sole Full of Rhythm, including info on upcoming performances, please fill out and submit the form below. Please consider sending a donation today to help keep dance alive in our community. Sole Full of Rhythm, Inc.